Topics: Top Gyms, Gym Deals, London Areas, Spa Deals, Personal Trainer, and Personal Trainers. The site has about 42 users daily, viewing on average 1.80 pages each. It has 2 DNS records, ns.rackspace.com, and ns2.rackspace.com. 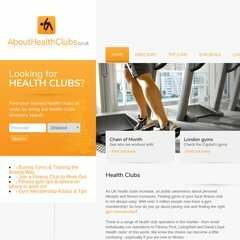 Abouthealthclubs.co.uk's server IP number is 184.106.145.150. PING www. (184.106.145.150) 56(84) bytes of data. A ping speed test response, is timed at 12.9 ms.